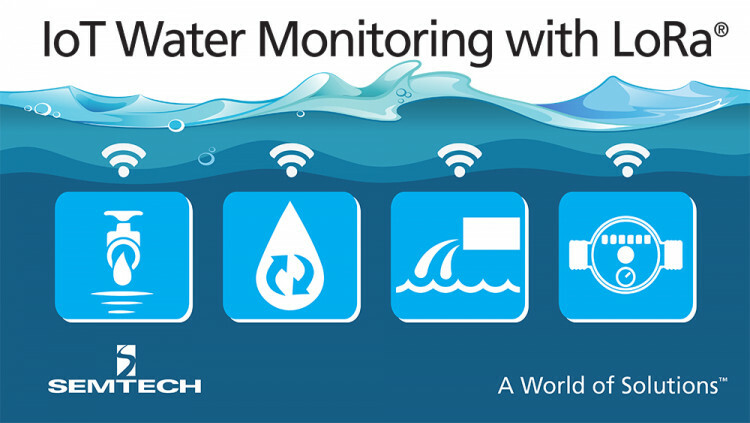 Semtech Corporation (Nasdaq:SMTC), a leading supplier of analog and mixed-signal semiconductors, today announced its LoRa® Wireless RF Technology is being used in Trimble’s new Telog® 41 Series of wireless Internet of Things (IoT) sensors for remotely measuring, monitoring and analyzing water, wastewater and groundwater systems. As part of a smart water infrastructure, the Telog 41 Series allows utilities to more easily and economically deploy a broad range of wireless monitoring solutions to address issues many municipalities face such as water shortages, flooding, budget constraints and environmental regulations. Using Semtech’s LoRa Wireless RF Technology, the Telog 41 Series sensors are designed for low-power operation, extended battery life, strong signal range in both dense urban and rural areas, as well as interoperability with existing infrastructure to reduce upfront investment cost. Semtech’s LoRa Technology is especially effective in sensor-based applications due to its low-power battery operation and strong communication capability in regional, national or even global LoRaWAN networks. The LoRa-equipped Telog 41 Series includes five different sensors, each customized for a specific use case: pressure monitoring, level monitoring, flow monitoring, pulse/event monitoring and rainfall monitoring. The sensors work in combination with software (either Cloud-hosted or on-premise) that has been developed to provide utilities with a single platform for smart water management and are designed to relay data to the software in intervals from every five minutes to 24 hours, depending on the use case. This allows data to be monitored remotely, giving companies access to near real-time data, including alerts, alarms, advanced analytics and reporting. The use of low-power LoRa Technology allows the sensors to have a battery life of 5 years assuming 15-minute transmission intervals. Long Range: A single LoRa base station enables deep penetration capability for dense urban environments and indoor coverage, while also providing the ability to connect to sensors more than 15-30 miles away in rural areas. Trimble’s Water Division provides technology solutions to the global water, wastewater, stormwater and environmental water industries. By combining software, hardware, wireless communications and sensors, Trimble Water’s industry-leading Internet of Things (IoT) monitoring and analytics, mapping and asset management and field solutions help customers optimize asset performance, field productivity, and compliance while enhancing safety, sustainability and service. Trimble Water solutions enable customers to address a wide range of challenges from asset monitoring, pressure and leakage management, sewer overflows and flooding to water quality, meter data collection and field operations across the global water industry. For more information about Trimble's Water solutions, visit: www.TrimbleWater.com. All statements contained herein that are not statements of historical fact, including statements that use the words “will,” “committed to,” or other similar words or expressions, that describe Semtech Corporation’s or its management’s future plans, objectives or goals are “forward-looking statements” and are made pursuant to the Safe-Harbor provisions of the Private Securities Litigation Reform Act of 1995, as amended. Such forward-looking statements involve known and unknown risks, uncertainties and other factors that could cause the actual results of Semtech Corporation to be materially different from the historical results and/or from any future results or outcomes expressed or implied by such forward-looking statements. Such factors are further addressed in Semtech Corporation’s annual and quarterly reports, and in other documents or reports, filed with the Securities and Exchange Commission (www.sec.gov) including, without limitation, information under the captions “Management's Discussion and Analysis of Financial Condition and Results of Operations” and “Risk Factors.” Semtech Corporation assumes no obligation to update any forward-looking statements in order to reflect events or circumstances that may arise after the date of this release, except as required by law.